Eliminate Full Price: Mailbox Monday - Happy President's Day! Happy Mailbox Monday and President's Day everyone! I received a lot of goodies in the mail. My favorite is the eBates check of $46.69 which is going into my Backstreet Boys and Glee tour fund. If you haven't joined eBates yet, you should by clicking here. It's a great way to earn cash back on online purchases. 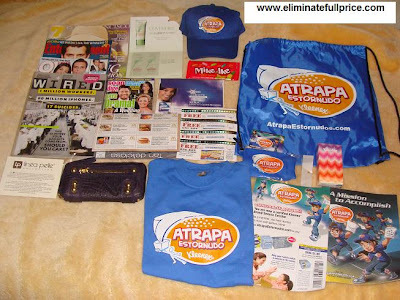 -Kleenex Atrapa pack that includes a bag, kids t-shirt, hat, travel Kleenex pack, coupon, activity book, and Kleenex travel pack holder. You always win the coolest things! I want Mike & Ikes! I've been trying my luck at online sweepstakes this month. Hopefully, something will come out of it. Happy MM!